The top criminal justice schools in South Carolina provide training programs for those looking for a degree or certification in preparation for a rewarding career as a lawyer, police officer, correctional officer or judge. South Carolina boasts some of the safest cities in the country – 30 cities made the list by Safewise in 2015 for their low crime rates as reported by the FBI. However, there are still certain parts of the state that need experienced legal and protective services professionals to preserve public interest and promote safety. Use this page to discover education programs and attractive job opportunities available throughout South Carolina. After Criminal Justice School in South Carolina: What's Next? Beginning a career in legal or protective services starts with finding the right academic or certification program that fits a student’s career goals. It is often difficult to decide which schools are best, but by utilizing the ranking list below to assist with the search, students will be able to compare schools by acceptance rate, tuition, student-to-teacher ratio and other factors. 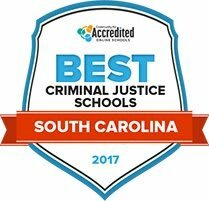 Discover the best criminal justice schools for 2017 in South Carolina below. Charleston, South Carolina is home to Trident Technical College, a two year school that confers a Criminal Justice Associate in Applied Science degree. The program is designed to meet the educational needs of professionals currently working in the criminal justice field. Two other populations that the degree is for are adults wishing to pursue a criminal justice career and people who are seeking advanced degrees like Bachelor and Master degrees in the field. The homeland security two year degree is a complementary credential that is also offered at the college. Courses in the programs cover areas like terrorism, emergency management and criminology. Aiken Technical College is located in Aiken, South Carolina. The college has been in operation since 1972. Training for adults who want to work as police officers, court clerks, probation officers, corrections officers and investigators is provided through the college's Criminal Justice Associate in Applied Science degree. Students can continue their education and earn a Bachelor's degree by enrolling in Aiken Technical College's Criminal Justice Transfer Associate in Arts program. To access class materials while pursuing the degree via the school's distance education option, students log into Blackboard, MyATC and MyLabs. Discussions are held between students, their classmates and instructors using campus email. York Technical College operates on an open admissions. Annually, the college enrolls between 5,000 and 7,000 students in credit based courses. Accreditation to award degrees like the Associate of Applied Science in Criminal Justice comes through the Southern Association of Colleges and Schools Commission on Colleges. Crisis intervention, police community relations, juvenile delinquency and criminal evidence are classes that students declaring the major take. Minimum grade allowed in all classes is a 2.0. College entrance exam scores are required to get admitted into the program. There is no program application fee. More than 2,300 students attend the Technical College of the Lowcountry, with the majority of students attending the school part-time. The Criminal Technology Associate of Applied Science degree is for adults who want to serve in corrections, on police forces and in juvenile delinquency and homeland security units. Major areas that instructors focus on during the academic program include computer forensics, criminal law and crime scene investigations. To enroll in the program as a security officer students need to be at least 18 years old. Police officers enrolling in the program are required to be at least 21 years old. Criminal justice associate degree classes start on fall, spring and summer semester schedules. Course material is delivered by instructors during the daytime and evening. An online learning option is available. College entrance exams needed are the ASSET or COMPASS exams. Instruction is approached from a practical and a theoretical standpoint. A 2.0 GPA or higher is required in classes. Criminal law, criminal investigations, cyber crime and ethics are courses built into the curriculum. The training aligns with needs of jobs such as police officer, juvenile counselor, corporate security officer and homeland security agent. The criminology program at Coker College hinges upon preparing students for careers in which communication and critical thinking are paramount to success, and facilitates such through the ñround tableî leaning method. This technique fosters collaboration and idea-sharing and is a primary facet of developing the necessary skills for careers in the public safety, corrections, or court-affiliated realms. With a range of flexible degree completion options, courses can be completed at various locations, while graduate students have the option to complete an online Master of Science in Applied Criminology degree in as little as 15 months. Offering a bachelor's degree in sociology with a criminal justice emphasis, the Lander University program offers reduced class sizes, career preparation resources, and opportunities to study abroad. Career paths within this major include roles with federal or state agencies, in addition to opportunities to work with at-risk youth and in juvenile justice. The program provides an overview of the criminal justice system, in addition to policies and operations, building a robust platform of knowledge to continue toward graduate level education or directly into the career field. Internships for senior year students offer experience and knowledge application for course credit. Accredited through the Commission on Colleges of the Southern Association of Colleges and Schools, Southern Wesleyan University is a faith-based institution offering a bachelor's degree program in criminal justice studies. Accredited through the Southern Association of Colleges and Schools Commission on Colleges, the programs' core curriculum covers a range of disciplines including statistics research methods, and forensic science, while combining the college mission of faith and service. A minor option is also available, as well as a newly implemented facility to house criminal justice event and lab resources. Non-credit courses are offered as an online resource to students who wish to gain knowledge in the field without completing a degree. With a range of degree options at both undergraduate and graduate levels, the University of South Carolina criminology and criminal justice program provides an academic path for student pursuing careers within the criminal justice system. Graduate students can achieve a master's or PhD in criminology and criminal Justice, or a dual master's/juris doctor in criminology and criminal justice and law, while the Bachelor of Science degree in Criminal Justice can be completed online after the completion of two years of credited courses. All programs provide a foundation for careers in law enforcement, security, crime scene investigation, and a range of other career options. The department of criminal justice at the Citadel Military College of South Carolina provides students with various degree path options. Undergraduate students can pursue a bachelor's degree in criminal justice, while graduate students have the choice to seek a master's degree in social science, intelligence and security studies, or graduate level certifications. Flexible options to accommodate busy schedules include an evening program, as well as fully online options for degree completion. Additional resources related to the department include the Criminal Justice Society which sponsors fundraisers and events to cater to the interests of those on a career path within the criminal justice field. Some of the most in-demand criminal justice jobs in South Carolina require a degree as well as intensive training at a dedicated training academy or other facility. Anyone interested in serving as a detective, court reporter, police officer or a judge with the state courts system may need formal training at an accredited school. Use the tool below to compare some of the top schools in the state based on criteria like degree programs available, tuition/fees and majors. The USC Police Department in major cities, public safety departments, and city government organizations are some examples of employers who hire law enforcement and legal service providers in South Carolina. Completing an accredited degree program in criminal justice or obtaining certification can increase the chances of achieving employment in one of these fields. The tool below allows you to compare different career options and salary information for some of the most in-demand jobs South Carolina’s legal and protective services departments. Most high-paying criminal justice jobs in South Carolina can be found in larger cities such as Columbia and Charleston, but graduates may also find employment in home offices of police departments, investigative firms, or law firms. Those starting their job search might find opportunities with the South Carolina courts system or with the SC Department of Corrections. The table below highlights different career opportunities in South Carolina compared to national averages. The South Carolina State Government is the state’s largest employer and manages numerous agencies and departments in the legal and protective services fields. Those looking to work in administrative law courts, highway patrol, or law enforcement can find jobs in larger cities, such as Columbia, Charleston and North Charleston. Taking some time to compare available jobs and salaries to national averages can help students make long-term career decisions. Compare average salaries for job opportunities across the state. Bailiffs at SC State Courts; Correctional Officers and Jailers at SC Department of Corrections; Detectives and Criminal Investigators for private and public detective firms; Fish and Game Wardens for SC Department of Natural Resources; Parking Enforcement Workers for SC City Government Organizations; Police and Sheriff's Patrol Officers for SC Police Departments; Transit and Railroad Police for SC DOT; Animal Control Workers for Greenville County Animal Care; Private Detectives and Investigators for SC PI firms; Gaming Surveillance Officers and Gaming Investigators for SC Casinos; Security Guards at SC hospitals, malls and schools; Crossing Guards for SC Department of Education; Lifeguards, Ski Patrol and Other Recreational Protective Service Workers at SC State Parks; Transportation Security Screeners for SC airports. Lawyers for SC State Government; Judicial Law Clerks for SC Courts System; Administrative Law Judges, Adjudicators and Hearing Officers for SC State Courts; Arbitrators, Mediators and Conciliators at SC Judicial and State Courts; Judges, Magistrate Judges and Magistrates at South Carolina Judicial Department; Paralegals and Legal Assistants for SC law firms; Court Reporters at SC Courts; Title Examiners, Abstractors and Searchers for SC Real Estate Firms; Legal Support Workers for SC law firms. Individuals looking for business filing information, business opportunities or employment agencies will find a wealth of resources on this website. The site also includes the latest updates straight from the Secretary of State and business forms and fees. This section of the website includes information about permits and environmental compliance. It serves as a valuable resource for business owners and legal professionals who need access to the latest compliance records and updates. The SBA offers resources for small business owners and entrepreneurs who need help growing their businesses by offering education, loan opportunities and grants. This membership-based group provides resources for members of the legal profession who provide corporate counsel in the state of South Carolina. This section of the state website includes information for business owners planning to do business in the state, state laws and regulations, licenses and permits, and taxes and insurance. This organization helps grow new and existing businesses by promoting incentives, helping with buildings and sites and providing grants for community development and infrastructure improvement. The South Carolina Department of Corrections maintains a comprehensive website for victims, families, and employees. The site lists current employment opportunities at correctional facilities across the state. This is a medium security federal correctional institution. The website lists information about the facility and also links out to job opportunities with the Federal Bureau of Prisons listed on USAJOBS. This organization is committed to protecting public trust and safety while providing assistance to those who have been victims of crime. The website includes information about the most wanted list and a county office directory. This state agency supplies prevention, community programs, rehabilitative service and education for juveniles who are on probation, incarcerated or on parole in South Carolina. The South Carolina Department of Administration Division of Human Resources lists employment opportunities with government entities across the state. The state government is South Carolina’s largest employer and offers a wealth of opportunities for career advancement. This website features a comprehensive listing of all court orders, court rules, trial courts and court calendars. It also includes information for those interested in becoming a court reporter and resources for the judicial community. This section of the South Carolina’s Information Highway includes information about the state’s courts, judges and solicitors. It also includes information about the latest opinions and orders for the Supreme Court and Court of Appeals. This membership-based organization connects court reporters within the state of South Carolina. This non-profit provides out-of-court dispute resolution for individuals, families and businesses. Providing advocacy for children who have been abused and neglected, the Richland CASA provides volunteer and legal services that help children find permanent, safe homes. Lawyers and legal professionals who want to help low-income or underrepresented members of the community can provide low-cost services through this organization. The organization provides free legal help to those in need and is looking for qualified legal professionals to support its mission. Teachers, students, and legal professionals can find a wealth of resources on this site. It includes information about the Bar Foundation, latest news, and educational materials for those who wish to further their career. Volunteer lawyers can join or support the pro bono program at the University of South Carolina. This section of the site also includes information about fellowships, leadership programs, and other resources for those entering the legal field. Affiliated with the National Association of Legal Assistants, SCUPA provides membership-based services for networking and continuing education. This directory offers contact information for the various bar associations throughout the state. This site provides contact information and resources for South Carolina residents about state legal cases and law enforcement training and standards. This website is a comprehensive listing of South Carolina police departments and includes details about sheriff’s offices police departments and fire and rescue apartments across the state. Includes information about different types of cases, law enforcement initiatives, the latest news, and record checks. It’s designed for law enforcement officials but also includes information about weapons permit renewals. Supports the efforts of law enforcement officers throughout the state and serves as a professional organization to provide training programs, recreation activities and networking events. A professional organization for South Carolina state patrol officers, this association connects troopers to improve communication and provide networking opportunities. This group aims to promote public safety by sharing information, providing educational community workshops and enacting changes through the legislative process. This membership-based association supports the development of ethics and professionalism within the legal investigator community in South Carolina. This is the main website for the DNR and includes information about licensing, public land use, and recreation areas around the state. The website also lists employment opportunities. This page is a resource for the eligibility and steps required to become a game warden. This website includes information about the Hunting Heritage Action Plan that outlines hunting heritage activities. Includes the latest plans and evaluations, assessment reports, and resources for leaders. This website is a comprehensive compilation of all activities related to South Carolina’s natural resources. It includes details about final assistance programs, volunteer programs and local programs. The law enforcement division of the SCFC investigates timber transaction crimes, arson, and other forestry-related infractions. This page supplies information about the law enforcement team that protects South Carolina’s state parks.